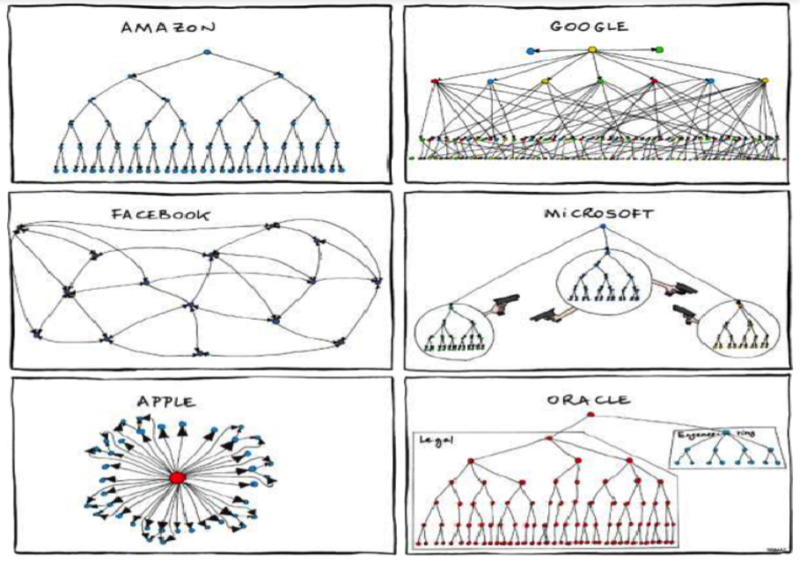 What should a ‘post-modern’ organisational structure look like? unpredictability, constancy and emergent nature of change. I was asked to do this because, we are in the process of re-designing our structure; and want, if possible to adopt a model that would foreground and engender relational practice. In short, there is a dearth of information on this subject! In the spirit of helpfulness and collaboration, therefore, I thought I’d put my musings online in case it is of help to others interested in this topic. An organisational structure is essentially a rationalised blueprint of activities and how they fit together to accomplish the work of that organisation. In modernist thinking, rational formal structure is assumed to be the most effective way of coordinating and controlling the complex relational networks of large organisations. There is normally a gap between the ‘blueprint’ (the way things should be done around here); and, the informal organisation (ie, how things really work in terms of culture and behaviours). Taps into the phenomena/power of getting things done through social networking but internally, ie, within their organisations. Many innovation-based companies have jumped on this band wagon, leading to the observation that many of these companies are beginning to look alike! There seem to be agreement that, at the moment, the gold star standard for doing this belongs to Apple. “take charge, help make decisions and feel responsible for the organisation’s success”. Flat structures only succeed with competent staff who have a likeminded interest in the success of the company. A key concept is the notion of “enterprise social networking”, ie the breaking down of traditional barriers by encouraging a social networking culture. The idea is that this kind of internal social networking (through appropriate IT) bypasses hierarchies by creating an environment where employees can dialogue with anyone from their organization. A friend from Facebook (who also worked from Google and Microsoft) advised that there is a difference between the rhetoric used for marketing/branding of these organisations, and lived reality of staff. He counselled interviewing their employees to get a sense of what its really like. 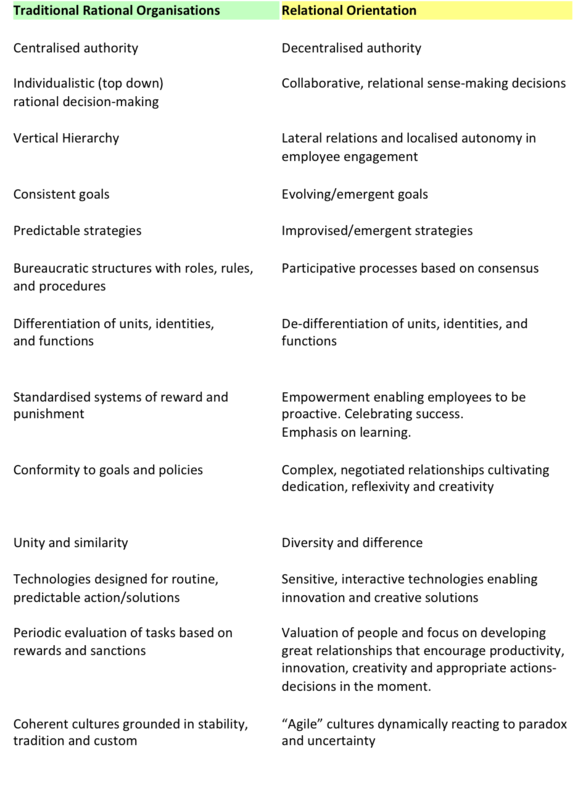 Some critics have observed that while the structures of these so called innovative companies are not traditionally hierarchical, they rely on other means of exerting (psychological) forms of control to achieve high level of compliance and productivity. May not be suitable for complex activities/organisations. This satirical diagram sums this up some of above concerns! Apart from a consensus that a agile and innovative organisations should be flatter, I couldn’t find any suggestions about organisational structures designed specifically to promote relational practice. It is about offering a narrative for responsible leadership and organising that is aligned with shared values and beliefs. Neither does it necessarily mean an inversion of hierarchy (with the associated danger of a pseudo collaboration) but the development of aesthetic and practical skills in managing power within a complexity of contexts with grace and respect to the Tearfund community and what we are called to do. I think the following diagram sums up beautifully where we want to get to. I’m sure that there are organisation structures that will enable rather than inhibit this from happening. I’m interested to keep exploring this. However, I’m beginning to wonder if a relational orientation is more about re-imaging/developing workforce as community and designing work that helps people to flourish. If so, we would do well to focus on developing people (OD) rather than worrying too much about designing a structure for this. Surely if we do the former well, the latter will emerge. Previous Post For unto us a Child is born, Unto us a Son is given; And the government will be upon His shoulder. And His name will be called Wonderful, Counselor, Mighty God, Everlasting Father, Prince of Peace! Patrick – thank you for sharing these insightful reflections. We do need a substantial paradigm shift and I am excited about what this can yield. You might also find the recent article on ‘IDEO’s Culture of Helping’ in HBR (Jan-Feb 2014) compliments your own thinking and provides live evidence (interestingly the subtitle of the piece is ‘By making collaborative generosity the norm, the design firm has unleashed it’s creativity’). Thank you for your kind words Sue and for the heads up on the article. I will read it with great interest. Love the phrase “collaborative generosity. One of my preoccupations as an OD/HR practitioner is how to engender a culture where we are ‘walking the talk’. We spend most of our lives at work. Wouldn’t it be great if these are life-giving and fun places to be!